Colorado State University-Fort Collins received a B.
Washington Monthly's ranking of 65 out of 277 of National Universities - Overall Rank was a major contributor to this grade. "Colorado State University is well-wired, mega-research institution in safe, panoramic Fort Collins. There are tons of majors available include everything from entomology (the study of bugs) to musical theatre. When on campus, impress students by singing CSU's fight song, which begins: "Fight on, you stalwart Ram Team, on to the goal; Tear the (opponent's nickname) line asunder"
Describe the type of student who should not attend Colorado State University-Fort Collins and explain why. Describe the type of student who should attend Colorado State University-Fort Collins. Why? What is a typical Colorado State University-Fort Collins student like? Describe the type of person that should attend Colorado State University-Fort Collins. There are diverse students from all walks of life at CSU, and any student could find a niche and thrive there. What are the top 3 reasons someone should attend Colorado State University-Fort Collins? What was a typical Colorado State University-Fort Collins student like in high school? Describe the type of person that should attend Colorado State University-Fort Collins. CSU turns out more STEM (science, technology, engineering, math) graduates than any other Colorado campus. Nestled between the edge of the Great Plains and the foothills of the Rocky Mountains. Certain majors and programs are more competitive and impose additional admissions qualifications. There's an environmentalist spirit and a wealth of outdoorsy opportunities. Colorado State University's roots go back to 1870, when the institution was founded as the Agricultural College of Colorado. The school first opened its doors to students in 1879 with President Elijah Edwards and two faculty members. From these humble origins, a world-class institution grew. Today, Colorado State University has more than 22,000 students, is a Carnegie Class I research institution with annual research expenditures topping $138 million. The university has approximately 1,400 faculty in eight colleges and 55 academic departments and boasts more than 116,000 living alumni. Included in this list are everything from state governors, heads of corporations, Olympic gold medalists, teachers, researchers, artists and many other leaders in society. Below is a complete history of the university, showing the growth, progress and accomplishment that has marked Colorado State over the past 127 years. This history dramatically charts the evolution of the institution from its humble beginnings to its current stature as leader in higher education in the state, nation and world. What are the top 3 things that students do for fun at Colorado State University-Fort Collins? The average student pays $13,487 for tuition, fees, and other expenses, after grants and scholarships. Total stated tuition is $7,494, in-state and on-campus, before financial aid. The typical (median) early career salary of Colorado State University-Fort Collins graduates is $45,700, according to Payscale. 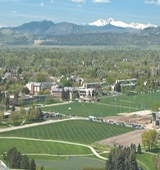 Colorado State University-Fort Collins participates in the NCAA Division I-A for college athletics. Want more info about Colorado State University-Fort Collins? Get free advice from education experts and Noodle community members. Can you be admitted with only a G.E.D.? Hello, Wondering if there is a recommended undergraduate program available at Colorado State if desired career (post graduate degree) is speech pathology? Thanks in advance! I was wondering if I attended your college, can I become a surgeon? I am wondering if I could become a Pediatrician if I attended your college?